The images in this gallery of beautiful wild birds were taken in the Greater Phoenix area. They were submitted by both travelers and local residents. This is the first gallery in a series of four. Be sure to check out the full four-part gallery of Arizona birds and waterfowl. 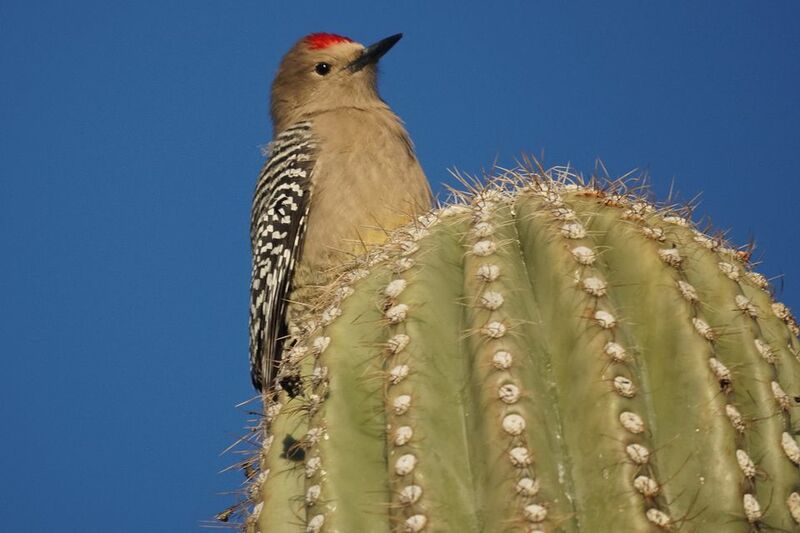 Pictured here, a Gila woodpecker enjoying a saguaro flower, Arizona's state flower. A hybrid hummingbird. From the photographer: "A once in a lifetime event. A very rare hybrid hummingbird, Broadbill x Violet crowned. Taken at Boyce Thompsom Arboretum. Last time this hybrid was seen was in Mexico in the 1890s." A great blue heron perched on a rooftop. When blue herons and egrets meet for the first time. Beautiful hummingbirds are commonly seen in the Phoenix area. Turkey vultures, however, are not as common in Phoenix as hummingbirds. A turkey vulture in flight in Gilbert. A great-tailed grackle: the thirsty bird takes a drink. A majestic great blue heron in flight. An immature black-crowned night heron, seen in Gilbert. Meet a burrowing owl, a member of the pigmy owl family. He was seen on the nature trail near the Gilbert library. From the photographer: "A peach faced lovebird, one of several living at the Gilbert Water Ranch." A beautiful view of a northern mockingbird in Gilbert. An action-shot of an Anna's hummingbird (male), seen in the vicinity of Westbrook Village Golf Course. Brad Lawrence, used with permission. Gambel's quail (Callipepla gambelii) are common in the Phoenix area. The male is the more colorful one, and the other is a female. You'll rarely see one flying; they mostly walk or run. Gambel's quail often don't build a nest for their eggs. They just usually deposit them under a bush or other foliage. A cute but responsible moment. From the photographer: "I scooped this guy up into a Styrofoam cup for a mug shot (no pun intended); then back with Mom before she got too excited. These guys were no more than a week old - he's less than 1 inch tall." Tony Perrino, Prescott, Ariz., used with permission. A Cooper's hawk perched on a Prescott porch. Tony Perrino, Prescott, AZ, used with permission. They don't go "beep, beep" like in cartoons, but roadrunners are common in the Phoenix area. This mallard hybrid was seen at the public library in Gilbert. Scottsdale not only has beautiful people, but it even has beautiful pigeons. A great egret at Freestone Park in Gilbert. This great egret at the Phoenix Zoo looks like it is dancing on the water. Harris hawks in Fountain Hills. From the photographer: "This beautiful bird and two of his friends visit the bird sanctuary in my yard everyday." A Crissal thrasher photographed in Fountain Hills. Jim Lewis, used with permission. A western bluebird photographed in the wild near Wickenburg. Neotropic cormorants drying their wings in the Chandler area. A black-crowned night heron seen in the Chandler area. A great egret (left) and a snowy egret (right) seen at a Chandler pond. Louise Mingua of Tempe, AZ, used with permission. Northern mockingbird photographed in Tempe. An American coot in Chandler. A curve-billed thrasher seen in Chandler. Maxine Piper, used with permission. An acorn woodpecker. From the photographer: "Acorn woodpecker waiting for his turn at the feeder in Strawberry." A black-headed grosbeak. From the photographer: "Male Black-Headed Grosbeak in an Alligator Juniper Tree in Strawberry." A pair of pygmy nuthatches. From the photographer: "Pygmy Nuthatches at the birdbath in Strawberry." A Stellar's jay. From the photographer: "Steller's Jay seen from the deck in Strawberry." A northern flicker, red-shafted Form. From the photographer: "The Flicker had stunned itself by hitting a window. We held it until it was able to fly off. (Strawberry, Ariz.)"
A northern cardinal. From the photographer: "The Cardinal was hard to photograph because I was so excited. In Gisela." A Harris hawk. From the photographer: "I was driving home from work, and at the corner saw this guy sitting on the light pole. Had to pull over and take a picture!" Tom Callahan, used with permission. A northern pintail. From the photographer: "This Northern Pintail was photographed at the Phoenix Zoo. Unusually it was a cloudy rainy day, and, yes, water does roll off a ducks back." Mari Bootz, used with permission. A greater roadrunner, photographed in Phoenix. © Brian Hankes, used with permission. A white-winged dove resting on a Saguaro with red blooms. The photo was taken in Fort McDowell near Scottsdale. A cactus wren. From the photographer: "Arizona state bird and state flower: a cactus wren atop a blooming saguaro." A black-necked stilt walks in water. From the photographer: "I photographed this Black Necked Stilt early on the morning of October 25th wading through the water near the south-western shore of Pond #1 at the Riparian Bird Sanctuary (Gilbert Water Ranch) in Gilbert." Learn more about the Riparian Preserve at Water Ranch in Gilbert. From the photographer: "I photographed this Great Egret coming in to land very early on the morning of October 25th near the south-western shore of Pond #1 at the Riparian Bird Sanctuary (Gilbert Water Ranch) in Gilbert."